Beyond Terroir, presented by Benjamin Bridge, Glooscap First Nation, and the Devour! Food Film Fest was a wonderful learning opportunity for all guests, Indigenous and non-Indigenous alike. Beyond Terroir combined the creative culinary collaborations of Chef Blair Lebsack, Kevin Kossowan, and Chef Kari Rose Lameman of Potlotek First Nation, paired with delicious wines from Bejamin Bridge, and traditional Mi’kmaq knowledge of the land. 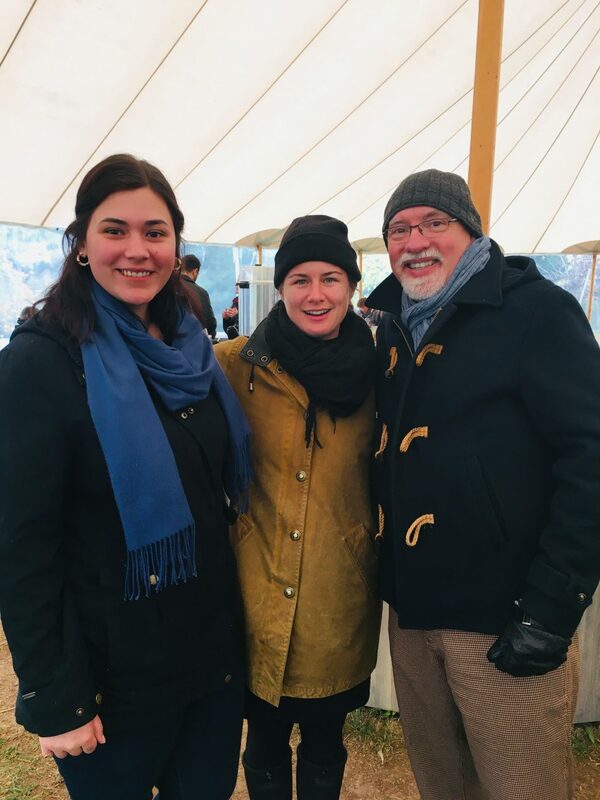 Beyond Terroir consisted of four stops, each entailing a gourmet dish prepared with traditional Mi’kmaq foods paired with Benjamin Bridge wines and musts, and culturally-informative lessons on different aspects of the Mi’kmaq people’s relationship with Mi’kma’ki (this place). Mi’kmaq culture can be expressed in innumerable practices such as song, dance, stories, ceremony, language and more. However, it’s important to recognize that the land is an essential part of this interconnection, as a great deal of our cultural identity comes from our relationship to the land, and to the creatures and objects upon it. We were greeted by Dr. Heather MacLeod-Leslie, an archaeologist, on our first stop. Dr. Macleod-Leslie introduced us to the natural ancient history of the Gaspereau Valley, and the various tools and foods that the Mi’kmaq people have harvested since the beginning of time. Chef Kari Rose Lameman served a delicious mushroom dish prepared with traditional foods and spices that were locally gathered, paired with the 2016 Benjamin Bridge Sauvignon Blanc and 2018 Sauvignon Blanc must. The smell of rabbit stew over the crackling fire filled the air at our second stop as Trevor Gould shared his knowledge of Mi’kmaq edible traditions that precede European arrival in the Valley. Trevor spoke about the relationship between the Mi’kmaq people and Mi’kma’ki, and beautifully reminded us of the interconnectedness of ourselves and the land. Trevor introduced the Mi’kmaq understanding that connects land and resource management, known as Netukulimk. Netukulimk is harvesting the gifts Mother Earth has to offer without comprising the integrity, abundance, and longevity of our environment. From the western perspective, Netukulimk refers to conservation, capability and stewardship, but for the Mi’kmaq people, Netukulimk is a way of being and interacting with Mother Earth. As Mi’kmaq people, we understand the importance of not taking more than we need, and to give back when we take from the land to ensure the next seven generations have the resources to sustain themselves. The homemade rabbit stew prepared with traditionally-sourced Mi’kmaq foods was stunningly paired with the 2013 Benjamin Bridge Méthode Classique Brut and 2018 Chardonnay must. During our third stop, Garett Gloade took us on a journey with his knowledge of the impacts of the incompatibility of European practices and Mi’kmaq ways of being, including diet, post European arrival. Prior to European arrival, the diet of the Mi’kmaq people consisted of foods high in fats and protein, similar to the currently popular “keto diet.” With the introduction of new foods and culinary practices, amidst other ideals, the cultural identity of the Mi’kmaq people was fractured. While Garett shared his knowledge with us, I was honoured to witness an eagle (Kitpu) fly overhead. Kitpu and their feathers are sacred to the Mi’kmaq people, and universally honoured by Indigenous people throughout Turtle Island (North America). Kevin Kossowan prepared moose meat with traditionally sourced herbs and spices which made a beautiful pair with the 2016 Benjamin Bridge Taurus and Maitake tea. During the fourth station, Cheyenne Isaac-Gloade spoke about the Mi’kmaq and the land today. She highlighted the resiliency of the Mi’kmaq people through our cultural identity and traditions that connect us to the natural world. She also shared her community’s battle to exercise their inherent treaty right to fish for salmon, and as she spoke there was salmon being traditionally smoked over the fire. The scent filled the air around us and reminded me of when my father would smoke salmon for our community’s annual pow wow in Gold River. The smoked salmon was an excellent match for the 2014 Benjamin Bridge Rosé and 2018 Muscat must. Photo: NSCC student Mika Francis, Beyond Terroir organizer Kelti McNeill, and The Grapevine’s Scott Campbell.